You can view your filing notifications at any time in Green Filing’s system. From the dashboard, click Notifications in the left menu. 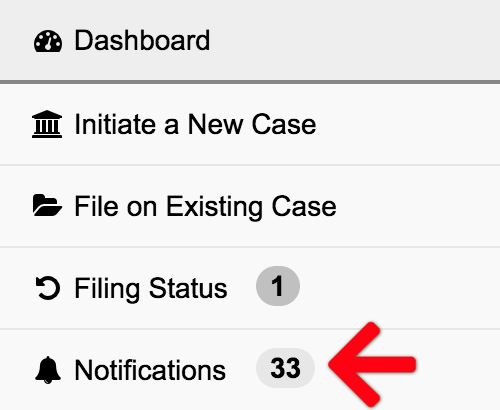 Once you open the notifications you will be presented with a list of all notifications generated by the Court to you. To view a notification simply locate the notification you are interested in and click on it. You can check mark the box next to the case number and then in red, you can click on “Read“. This will remove the update the new/unread badge count. These notifications are also sent to you by email. In a Service Notification email you may click View Document or opt to have documents attached to the email notification. If you choose to have the link in your email, you can click the link to be directed straight to the screen where you can view the notification, as well as download any documents identified in the notification.